Draft: 2012, San Diego Padres, 1st rd. Attended Harvard-Westlake High School in Studio City, Calif. for his senior year, where he was teammates with Lucas Giolito (White Sox)… Attended Montclair College Preparatory School in Van Nuys, Calif. for three years before the school cut all athletics ... Committed to UCLA before signing with San Diego. Split his season between Atlanta, Triple-A Gwinnett and Double-A Mississippi, going 1-4 with a 2.94 ERA (11 ER/33.2 IP) and 44 strikeouts in 14 games, five starts, at the big league level… Was 3-6 with a 3.94 ERA (34 ER/77.2 IP) in 15 combined games, all starts, in the minors ... Also missed 14 games on the 10-day disabled list with a left middle finger blister from 7/6-7/28 and 21 games with a left groin strain, 8/7-27 ... Began the season with Mississippi before joining Gwinnett on 4/12…Recalled to Atlanta for the first time on 4/24 and returned to Triple-A on 5/5… Had four more stints with Atlanta (5/17, 5/28, 6/30-8/27, 9/6-end of the season) ... Set career highs in innings pitched and strikeouts, 6/30 at STL, fanning 11 over 6.2 innings...Allowed just four hits and three walks to earn his lone win of the season ... Became the seventh pitcher in Atlanta franchise history to record double-digit strikeouts within his first 15 career games, and the first to do so since Aaron Blair fanned 10 on 10/1/16 vs. DET ... Made his first start with Atlanta, 5/28 vs. NYM in the first game of a doubleheader...Was added to the roster as the 26th man, and allowed two runs, one earned, over 5.0 innings ... Became the first Braves pitcher since Kevin Millwood in 1999 to pick off two runners in the same inning…Millwood did it on 7/18 at TOR…Between Millwood's two pickoffs and Fried's game, only six other major league pitchers accomplished the feat, with MIN's Kyle Gibson doing it last on 9/7/16 vs. KC ... Compiled a 2.49 ERA (6 ER/21.2 IP) and a 1-2 record in his five starts…Was 0-2 with a 3.75 ERA (5 ER/12.0 IP) all three of his home runs allowed in nine relief outings ... Allowed one hit over 30 at-bats (.033) with runners in scoring position…In these situations with two outs, opposing hitters were 0-for-14 with eight strikeouts ... Appeared in all four games of the NLDS vs. LAD, tossing 2.1 combined innings and allowing one hit and one run, earned. Made his major league debut while also spending time with Double-A Mississippi and Triple-A Gwinnett...The Braves recalled him from Mississippi on 8/5 and he made his MLB debut on 8/8 vs. PHI...Tossed 2.0 scoreless innings out of the bullpen…Had made two career relief appearances in the minors prior to his outing...Appeared in three more games, all in relief, for the Braves and allowed four runs in 4.2 innings (7.71 ERA) with no decisions before the club optioned him to Triple-A Gwinnett on 8/23...Returned to the Braves for the remainder of the season on 9/1. ..Made his first career start on 9/3 at CHI and earned the 5-1 victory after going 5.0 innings and allowing one run and four hits…Of the four Braves to make their first career start in 2017, Fried was the only one to win...Joined with Luiz Gohara and Sean Newcomb to become the first trio of rookie left-handers to start for the Braves since 1945, when Bob Logan, Lefty Wallace and Bob Whitcher did it. 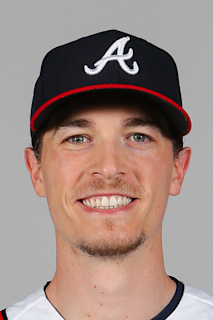 ..Started four of his final five games with Atlanta...Compiled a 3.44 ERA (7 ER/18.1 IP) as a starter at the MLB level...Spent the majority of the season pitching in Double-A Mississippi's rotation...Started the year with the M-Braves and went 2-11 with a 5.92 ERA (57 ER/86.2 IP) over 19 starts...Did not allow an earned run over his final three outings with Mississippi, 7/21-8/1...Did not allow a run across two starts with the G-Braves, while not recording a decision in 6.0 combined innings...Went 1-1 with a 3.44 ERA (7 ER/18.1 IP) in four starts with the Braves…Compiled a 4.70 ERA (4 ER/7.2 IP) in five games of relief for Atlanta...Limited lefties to a .258 (8-for-31) average, while righties hit .297 (22-for-74) with all three of the home runs he allowed...Pitched for Peoria in the Arizona Fall League and went 3-1 with a 1.73 ERA (5 ER/26.0 IP), 32 strikeouts and eight walks in six games, all starts. Spent the season with Single-A Rome after entering the season as the club's ninth-best prospect…Struck out 112 for a K/9 ratio of 9.79... Made his Atlanta organizational debut on 4/9 vs. Augusta…Tossed 5.0 innings and allowed three hits and three runs, two earned, to take a no-decision…The start was his fi rst action since 7/21/14 after he missed all of 2015 recovering from "Tommy John" surgery...Helped the R-Braves to the South Atlantic title after winning both his playoff starts while compiling a 1.23 ERA (2 ER/14.2 IP) with 24 strikeouts…Beat Charleston, 4-1, in the deciding game of the series on 9/10 with 7.2 innings and 11 strikeouts…Then tossed 7.0 innings with a careerbest 13 strikeouts to close out Lakewood on 9/16... Ended the season in the Top 10 among Atlanta's pitching farmhands in wins (T7th, 8) and strikeouts (T9th, 112), and his eight victories established a new career high... Made two trips to the disabled list due to a blister, fi rst from 7/5-15 and again from 7/16-8/14...Went 9-5 with a 2.74 ERA (26 ER/85.1 IP) over his fi nal 16 games, 15 starts…Started the season 1-2 with a 5.85 ERA (21 ER/32.1 IP) in his fi rst seven starts through 5/14... Fanned 44 batters in 25.1 innings over his fi nal four starts of the season (including playoff s)… Collected consecutive 10-strikeout games before fanning 11 and 13 in his two playoff starts. Opponents hit .236 (87-for-369) on the season, including a .233 (24-for-103) mark by lefties... Allowed just four earned runs over a seven-start stretch from 6/3-7/15, going 5-1 with a 1.06 ERA (4 ER/34.0 IP) in that span... Finished the season as the sixth-best prospect in the SAL according to Baseball America... Added to the 40-man roster on 11/18. September 6, 2018 Atlanta Braves recalled LHP Max Fried from Gwinnett Stripers. August 27, 2018 Atlanta Braves optioned LHP Max Fried to Gwinnett Stripers. August 27, 2018 Atlanta Braves reassigned LHP Max Fried to the minor leagues. August 17, 2018 Atlanta Braves sent LHP Max Fried on a rehab assignment to Gwinnett Stripers. August 8, 2018 Atlanta Braves placed LHP Max Fried on the 10-day disabled list. Left groin strain. July 28, 2018 Atlanta Braves activated LHP Max Fried from the 10-day disabled list. July 23, 2018 Atlanta Braves sent LHP Max Fried on a rehab assignment to Mississippi Braves. July 18, 2018 Atlanta Braves sent LHP Max Fried on a rehab assignment to Gwinnett Stripers. July 6, 2018 Atlanta Braves placed LHP Max Fried on the 10-day disabled list. Left middle finger blister. June 30, 2018 Atlanta Braves recalled LHP Max Fried from Gwinnett Stripers. May 29, 2018 Atlanta Braves optioned LHP Max Fried to Gwinnett Stripers. May 28, 2018 Atlanta Braves recalled Max Fried from Gwinnett Stripers. May 18, 2018 Atlanta Braves optioned LHP Max Fried to Gwinnett Stripers. May 17, 2018 Atlanta Braves recalled Max Fried from Gwinnett Stripers. May 5, 2018 Atlanta Braves optioned LHP Max Fried to Gwinnett Stripers. April 24, 2018 Atlanta Braves recalled Max Fried from Gwinnett Stripers. April 12, 2018 LHP Max Fried assigned to Gwinnett Stripers from Mississippi Braves. April 2, 2018 LHP Max Fried assigned to Mississippi Braves from Gwinnett Stripers. March 16, 2018 Atlanta Braves optioned LHP Max Fried to Gwinnett Stripers. September 1, 2017 Atlanta Braves recalled LHP Max Fried from Gwinnett Braves. August 23, 2017 Atlanta Braves optioned LHP Max Fried to Gwinnett Braves. August 5, 2017 Atlanta Braves recalled Max Fried from Mississippi Braves. March 16, 2017 Atlanta Braves optioned LHP Max Fried to Mississippi Braves. November 18, 2016 Atlanta Braves selected the contract of Max Fried from Rome Braves. August 14, 2016 Rome Braves activated LHP Max Fried from the 7-day disabled list. July 17, 2016 Rome Braves placed LHP Max Fried on the 7-day disabled list retroactive to July 16, 2016. July 15, 2016 Rome Braves activated LHP Max Fried from the 7-day disabled list. July 6, 2016 Rome Braves placed LHP Max Fried on the 7-day disabled list. April 4, 2016 LHP Max Fried assigned to Rome Braves. December 19, 2014 LHP Max Fried assigned to Rome Braves. September 24, 2014 Fort Wayne TinCaps activated LHP Max Fried from the 7-day disabled list. July 28, 2014 Fort Wayne TinCaps placed LHP Max Fried on the 7-day disabled list. July 16, 2014 LHP Max Fried assigned to Fort Wayne TinCaps from Lake Elsinore Storm. July 3, 2014 Lake Elsinore Storm sent LHP Max Fried on a rehab assignment to AZL Padres. April 3, 2014 LHP Max Fried assigned to Lake Elsinore Storm from Fort Wayne TinCaps. March 31, 2013 LHP Max Fried assigned to Fort Wayne TinCaps from AZL Padres. July 2, 2012 Max Fried assigned to AZL Padres. June 15, 2012 San Diego Padres signed Max Fried.